Book Bin from The Library Store, Inc. I'm not out to convert anybody, but to share the story of my conversion. Let's talk about bins. Specifically bins for picture books. The kind where the books are all standing forward with the covers facing out. When I started my new job I was really annoyed to find that all the libraries in the system used them. "How do you find things for the pull list?" "They aren't in order! How do you keep them in order?!" I thought it was such a disservice to users; not having things in order or easy to find. I was seriously disgruntled that I would have to deal with picture book bins. It went against every fiber of my organized librarian being. At my old job I supervised both the library clerks and library pages. They all hated the picture books. They hated shelving them, and they REALLY hated shelf-reading them. But they needed to be shelf-read all.the.time so I was constantly dealing with push-back on picture book maintenance. If only those darn kids would just keep their little hands off the books so they'd stay in order. With bins, every single bin is a display. And the best part? They are self-filling displays! If the front book gets chosen the next book proudly stands forth. No glaring empty spot in sight. There are also bins with cool little display platforms. Not every collection benefits from strict alphabetical order. The majority of use picture books receive is from browsers. Making the collection easier to browse is better service. Yes, it might be slightly more inconvenient to a student or someone looking for specific books...but I spent a lot of time helping people find specific books that were supposedly in order with traditional shelving too. Managed chaos is the nature of the kids area. I'm embracing it. Apparently (before my time) every single library in my system increased circ on picture books after bins were installed. Kids and families love them, and increased circ is something I can definitely get behind. Not only are they perfect kid height, and high in kid appeal, I can find things faster too. It's much quicker and more accurate for me personally to flip through covers (while standing) than to read call numbers (while kneeling on the floor). I rarely miss the book I'm looking for this way, which I would often do when scanning call numbers. The covers and art are generally much more recognizable to me. 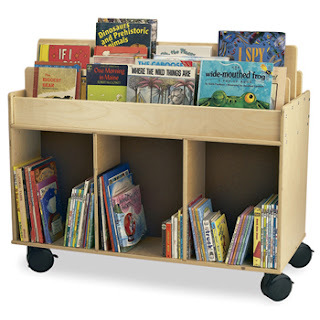 With bins, I give faster, better, more accurate service to patrons when helping them find books. The department stays much tidier with bins. No more facing shelves and making sure all the spines line up. No more tipped bookends. I seriously wish I could go back in time and change my old library over to bins; it would have been a great fit at that little library. Page and clerk staff at my new library also prefer the bins, so they're happier too. All that being said? The DVDs are only in order as far as the first letter, and then it's a free-for-all. Drives.me.CRAZY. Thanks, Anna. We're converting to bins in a few months. For now we weed. The hardest part in this has been the weeding....so many books. There goes the backlist! I value the backlist. But, I suppose if a book hasn't gone out in 2 years, what's the point. I miss bins! The first library I worked at had them, and yes, it is hard when working with someone who wants a very specific title that you only have one copy of, but its way better than the system at my current library (alpha by first letter, and size) due to built-into-the-wall wooden shelves. I have spent so much time over the last 2.5 years trying to devise a better system that wouldn't involve something like relabeling all the books. Still thinking. The only thing I loathe about bins (so that means I mostly love them) is the space they take up. As a resource library we can only weed the picture books down so far. Until the funds become available for adding space to our children's area we are stuck with shelves (Patooie...ah, spitting always makes me feel better). But every library I've worked at with bins has worked swell. I was really loathe to have boxes for books. I like some semblance of order but since I inherited some movie boxes that I will not use for that purpose, I decided to give it a try. I've put some of my easy books in the boxes and will figure out a labelling system (for my sanity) and see how it goes. Thanks for the inspiration to try something new. What do you put in the little spine-out areas below? I genrefied fiction last year (LOVE) and as we are looking to get new shelving (YAY!) I have decided that, in observing how primary students locate books and request books as well as their struggle with book ends..upside down, spine in, etc.., forward facing browsers would make the most sense with placards in the front designating GENRE! So I will genrefy princess and fairytales, dinosaurs, animals, and so forth- based on the collection and interests of younger patrons. I was thinking the bottom shelves could be famous authors, hopefully I can match them within the genre, these are generally the most teacher requested as they do author studies or remember their "old favorites" but generally do not circulate much among the children. Also, I noticed DRASTIC price differences in forward facing browsers- BCI $3600 per unit, DEMCO $1700 per unit, BookBins $600 per unit!